Great idea for the transition from mom's abdomen to cot. ★ You can put in the baby nest between you in your bed, without any worries to make a harm for a little baby while sleeping at night♥. 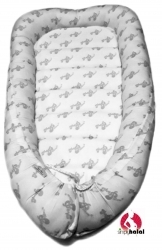 ★Or just put the baby nest in the crib or bed. ★You can use it as a changing or play mat. ★Take the babynest in the pram or while traveling. Always a safe and secure feeling. Tip: do not walk around with your baby in the baby nest and place always the nest on a flat surface!